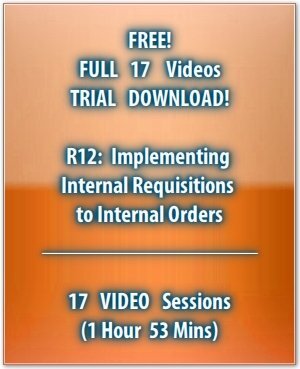 Why do we need Internal Requisitions and Internal Sales Orders? Internal Requisitions (IR) and Internal Sales Orders (ISO) are used to transfer material from one inventory organization or warehouse to another, within the same company. Why not use Inter Organization Transfer Feature? IR and ISO provide us with a way to transfer material where we can introduce an approval mechanism for ordering material, and also track the transaction through documents. These features are not available in the Inter Organization Transfer utility. The inventory organizations involved in the transaction may belong to the same Operating Unit or they may belong to different Operating Units. Which Oracle Products are required to run this Process? For this business process to be implemented, we need Oracle Purchasing, Order Management and Inventory to be installed. When Purchasing, Order Management, and Inventory are installed, we can use the existing forms for creating requisitions and sales orders and use the existing requisitions and sales order functionality to configure and execute the internal ordering cycle. The organization that requisitions the material should have an employee, who is authorized to enter an internal requisition in the system. This employee also needs to be assigned to an Approval Group where, by virtue of his position he is either able to approve the requisition himself or forward it to an approver who can approve the IR for him. Material has to be requisitioned by an organization, called the Destination Organization. This is the organization that creates the IR. This material will be supplied by an organization called the Source Organization. This is the organization that ships the ISO. These two organizations need to have a Shipping Network defined between them, which allows for movement of material between them through the use of IR only. The IR should carry the destination location as a valid internal Ship To location defined within the destination organization. Now, since the destination organization acts as a customer, it should be defined as an Internal Customer in Order Management. For the internal requisition process, an internal customer is one, which is associated to an internal location as the Ship To location. So, if an order is raised for this customer, then the Ship To location on the order header would be the internal location assigned to this customer. Price: $19.99 ONLY for 1 PC!! !